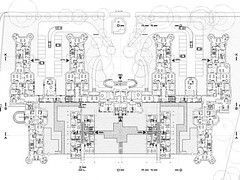 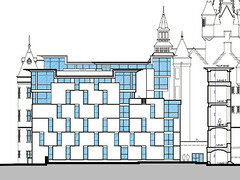 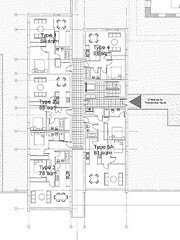 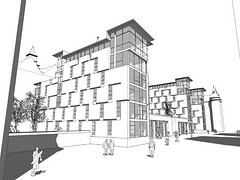 As part of Foster and Partners overall master plan for the whole site of Edinburgh's former Royal Infirmary we have been asked by Quatermile to look at the redevelopment of the Grade A Listed Surgical hospital which will be refurbished and developed to provide 174 units of residential accommodation and leisure facilities. 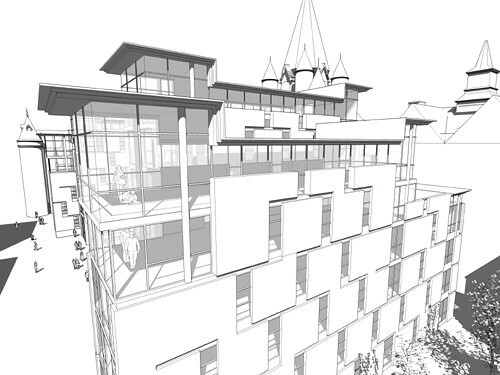 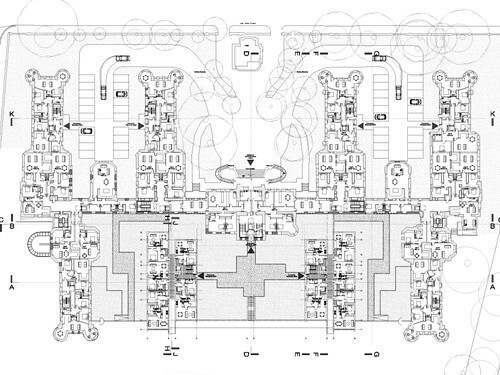 This is a change from the use proposed in the original planning approval which was for a 218 bed, 5-star hotel. The 174 units are split between 118 flats accommodated within the refurbished original building and 56 provided by two new build extension wings to the rear of the building. 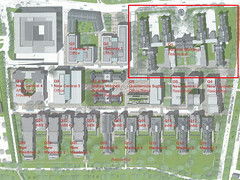 The refurbished units in the original Surgical Block occupy the central tower and corridor areas and the 6 former ward pavilion wings, which extend off the building, 4 to the north and 2 to the south. 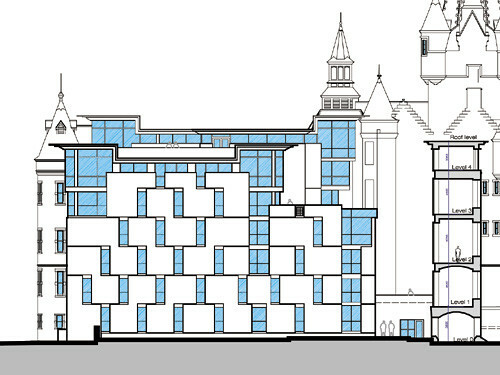 Selective demolitions of large areas of later additions will return the building to something close to William Bryce's original design. 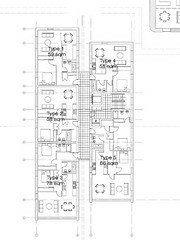 New stair and lift cores are inserted within the corridor and ward areas of the building to access these groups of flats. 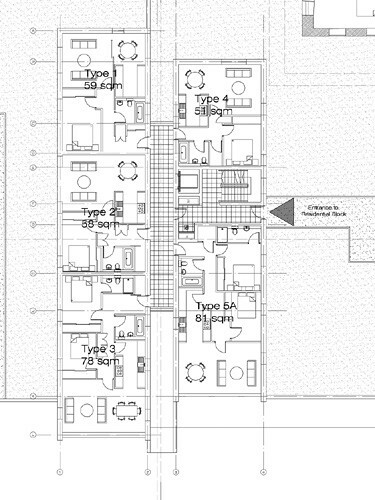 In addition, where the existing storey heights allow, mezzanine floors have been created within flats to provide a greater variety of flat sizes and types and maximise the use of the building section. 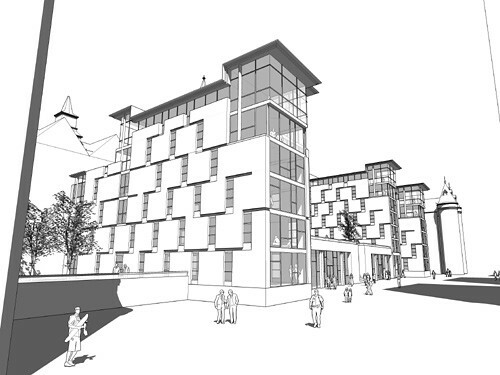 The new-build elements will be formed in two wings located to the rear of the Surgical Block. 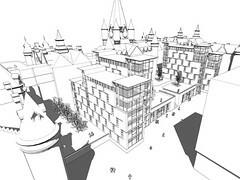 These wings will be formed as two parallel blocks rising to six storeys above three private garden courts and continue the pattern set by the ward blocks of the existing building. 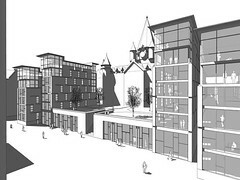 The garden courts allow light and space into the flats and provide an extension of the open space and public realm into the footprint of the existing building. 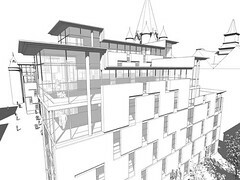 To the centre the garden is set above a ground floor plinth which will house a proposed leisure facility which will extend into the ground floor of the original building within the tower block. 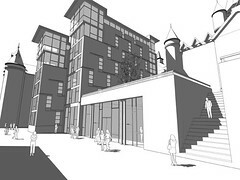 Glazed facades to the south of the facility might allow gyms, pool or cafe to address the street. In addition the ground floor of the two south side existing wings will offer retail space, perhaps for a cafe and bar addressing the new central piazza and middle meadow walk respectively.